One of the most prestigious continental Croatian white wines. 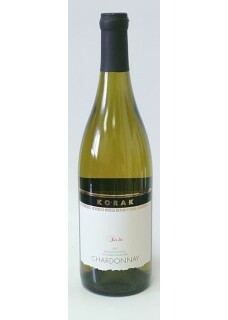 The winemaker of the year in 2009, Mr. Velimir Korak produced this Chardonnay by the method called sur lie , rather the care of the wine after fermentation in barrique barrels on the yeast, which are frequently mixed in regular cycles. This is an old burgundy technology for white wines and the best effects are achieved specifically on the chardonnay.The smell of the Korak sur lie is a complex and dominated by soft hazelnut and pistachio, followed by a variety of different flavours, from mature melons and figs, through butter to smoky notes. The flavour is very rich, slightly spicy, nicely balanced acidity and lasts very long. Velimir Korak, has been producing high quality wines for over 20 years now although the family tradition dates back centuries. With devoted work and love for the job, he has always been a little bit different from the others, and is even quite modest in pointing out that the first ever superior quality domestic Chardonnay which reminds on the Burgundy crus, his Pinot Noir came onto the market from his cellar, and knowing the way he does things, we can expect new surprises. The five hectares (over 12 acres) of vineyards include Riesling, Chardonnay, Sauvignon Blanc, Pinot Grigio, Pinot Noir, Syrah and Portugizac. The Riesling is the most widely planted grape in the Plešivica region. Josip noted that some of the vines in the wineyard are very old. In mid-March the vines were still dormant for the winter allowing one to observe the ups and downs of the landscape. After being named one of the top 20 winemakers three years in a row, in 2008 Velimir Korak received the title of Croatia’s best winemaker!